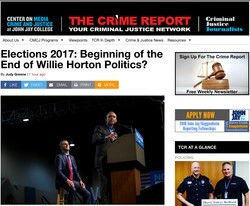 Elections 2017: Beginning of the End of Willie Horton Politics? In this article for The Crime Report, Justice Strategies' Director, Judith Greene, raises the prospects that the 2017 elections may indicate signs that we are turning the corner away from politicizing crime. The results in off-year gubernatorial elections indicate that urban/suburban voters in both Virginia and New Jersey are no longer swayed by “penal populism.” Republican candidates were soundly defeated despite their attempts to gain political capital by stoking fears of an immigrant crime wave which does not exist.